Gel candles are a new and exciting product in candle making. I buy and use the best quality ingredients. The gel burns cleaner and lasts much longer than regular wax candles. As a general rule of thumb, gel candles will burn 8 hours for every ounce of gel in your candle (for a standard size 1 wick candle). My gel candles are each individually hand crafted by me. My area of operation is Lubec, Maine; the farthest point East in the continental United States. Our county is known as the Sunrise County. 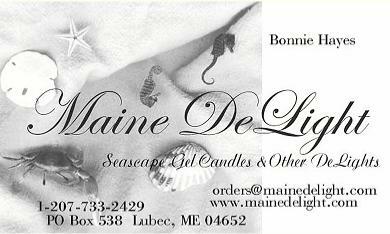 Maine DeLight Seascape and Wildlife candles are wonderful to look at as a decoration in daylight, but when lit in a darkened room they are stunning. 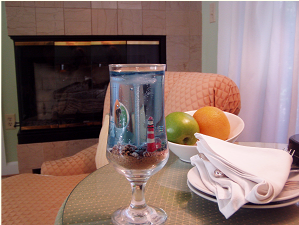 These candles will glow and light up the sea life or wildlife depicted. It is like viewing a special underwater or woodland scene frozen in time. These gel candles give you a taste of New England with scenes including: lighthouse, dolphins, nautical scenes with real sea life, moose, bear, deer, eagle, loon, puffin, seagull, wolf and more. In the seascapes you will find real starfish, seashells as well as coral from Eastport, Maine and seaglass from Lubec, Maine. 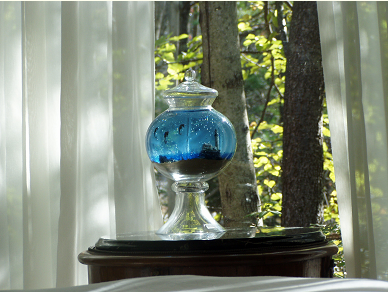 Enjoy the tranquility and gentle fragrance. As with any candle, caution must be taken and directions are listed on the bottom of each candle. Please take the time to read and follow the instructions for safe and proper care. I hope you will enjoy many hours of viewing pleasure. I know I have enjoyed making them for you.